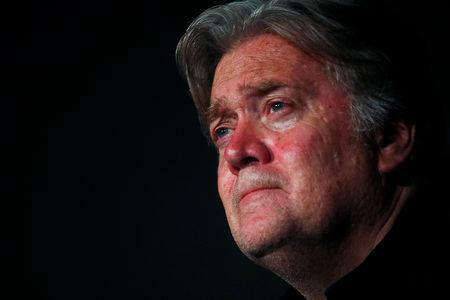 WASHINGTON (Reuters) - The U.S. Senate Intelligence Committee is pursuing a wide-ranging examination of former White House adviser Steve Bannon's activities during the 2016 presidential campaign, three sources familiar with the inquiry told Reuters. The committee is looking into what Bannon might know about any contacts during the campaign between Moscow and two advisers to the campaign, George Papadopoulos and Carter Page, they said. William Burck, a lawyer for Bannon, told Reuters: "The Senate Intelligence Committee has expressed an interest in interviewing Mr. Bannon as a witness, just as they have many other people involved in the Trump Campaign. But the Committee has never suggested that he’s under investigation himself and to claim otherwise is recklessly false." Papadopoulos, a consultant, initially advised the presidential campaign of Republican hopeful Ben Carson before joining the Trump campaign. Page is also a consultant, who had business contacts in Russia. On Sept. 7, Papadopoulos was sentenced to 14 days in prison. He had pleaded guilty last year to lying to FBI agents about the timing and significance of his contacts with Russians, including a professor who told him the Russians had "dirt" on Trump's Democratic presidential rival, Hillary Clinton. No charges have been filed against Page. The panel also will examine Bannon's role with Cambridge Analytica, a former data analysis company that the Trump campaign hired to help identify and target messages to potentially sympathetic voters, the sources said. The Senate committee is working with Bannon's advisers to set a date for him to be interviewed by staff investigators in late November, two of the sources said. Bannon recently met for the second time with investigators working for Special Counsel Robert Mueller, who is investigating allegations of Russian interference on Trump's behalf in the 2016 presidential election, one of the sources said. The Washington Post reported on Tuesday that Bannon was questioned last week by Mueller's team. The newspaper said the interview focused on Trump supporter Roger Stone. In emails to Reuters, Stone has said he did not know about or have access to WikiLeaks materials related to Democrats. In the run-up to the 2016 election, WikiLeaks published hundreds of emails hacked from the Democratic Party and the personal account of top Hillary Clinton campaign adviser John Podesta. One of the sources familiar with the Bannon-related Senate panel investigations said Mueller's team does not consider Bannon to be a potential subject of their investigation. Bannon served as a vice president of Cambridge Analytica from June 2014 to August 2016, at which point he joined Trump's presidential campaign as a senior strategist. Sources said the Senate Intelligence committee has sought to interview other witnesses about the role played by Cambridge Analytica and affiliated companies in the 2016 election. Earlier this year it was reported that Cambridge Analytica had collected the personal data of millions of people's Facebook profiles without their consent and used it for political purposes. Facebook later apologised to users for the data breach.